Instead, we get an evening of Wagner choral and orchestral works on July 20, with Dudamel leading the Phil and L.A. Master Chorale, a performance of Sondheim on Sondheim on July 23, with conducting, and the Broadway evergreen hit Mama Mia! on July 28, 29 and 30. No. 5, on July 27 conducted by Rafael Payare making his Bowl debut. Payare is another graduate of Venezuela’s El Sistema program (which also produced Gustavo Dudamel), winner of the 2012 Malkio conducting competition, and is now chief conductor of the Ulster Philharmonic in Northern Ireland. Concerto No 3, on August 15, with Behzod Abduraimov as soloist and Krzysztof Urbanski conducting. I can’t remember a season without either the fifth or sixth symphonies. Among “traditional” works NOT being presented: Violin concertos by Brahms, Beethoven, Sibelius and Tchaikovsky, Gershwin’s Rhapsody in Blue,, Stravinsky’s Rite of Spring, Vivaldi’s The Four Seasons. And, of course, little — if anything — that appropriates that woefully neglected genre: “light” classics. There’s no nothing to celebrate Leonard Bernstein’s upcoming centennial. • A full night of Vivaldi, with Simone Porter soloing in the Violin Concertos, Op. 4, Nos. 3 and 4, and the Pacific Chorale joining forces with Nicholas McGegan for Stabat Mater and Gloria. 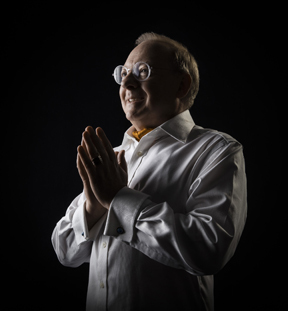 • A smattering (just a smattering) of Mozart: his Requiem on Aug. 24, paired with John Adams Harmonimum, with Dudamel conducting the LAPO and L.A. Master Chorale; and an all-Mozart program led by McGegan on the final classical night of the season, Sept. 14. 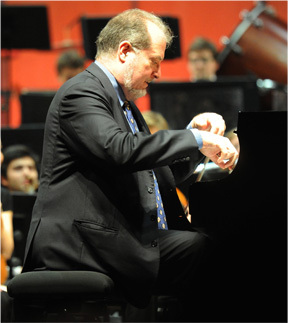 • Two L.A. Phil commissions: the world premiere of Daníel Bjarnason’s Violin Concerto (with Pekka Kuusisto making his Bowl debut as soloist; and Alan Fletcher’s Piano Concerto on Sept. 5, with Inon Barnatan as soloist and Ken-David Masur conducting the Phil. Masur made a well-received debut as a last-minute Bowl sub last season. 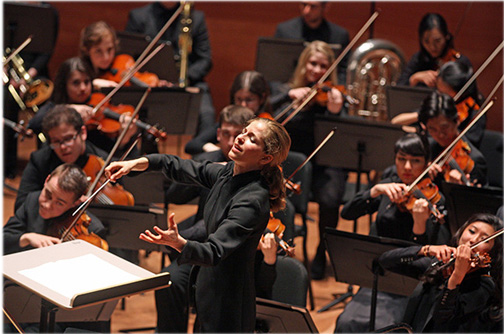 • The Bowl debut of conductor Karina Canellakis (pictured at the top of this post), who (one hopes) is on a very short list of conductors to replace Jeffrey Kahane after he retires this season at the Los Angeles Chamber Orchestra. She makes her Bowl debut on Aug. 8 in an all-Mendelssohn program. 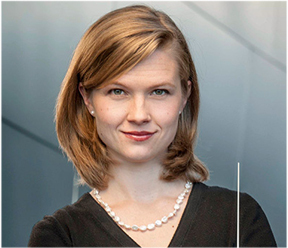 Canellakis, winner of the 2016 Georg Solti conducting competition, came to national attention when she stepped in not once but twice to replace Jaap von Zweden in Dallas Symphony concerts. My guess is that the San Diego Symphony, which is looking to replace Jahja Ling as music director. Either John Adams’ Harmonielehre or City Noir. As indicated before, Bowl subscription tickets, in a variety of combinations are now on sale. Single tickets go on sale May 7. The complete season schedule is HERE. The full media kit is HERE. 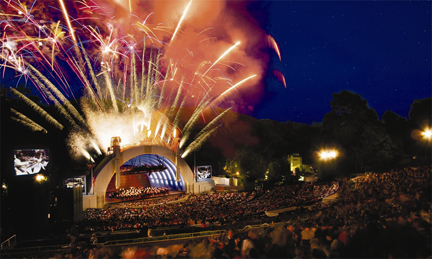 The 2017 Hollywood Bowl season, formally introduced via a media release this morning, extends the Bowl’s presence of showing movies on a big screen with the Los Angeles Philharmonic providing live accompaniment, offers more concerts led by Music and Artistic Director Gustavo Dudamel, and provides several notable differences from the “traditional” outdoor music concerts. The movie screenings begin with what has become an annual (and sold-out) event: The “Sing-Along Sound of Music, on June 24. 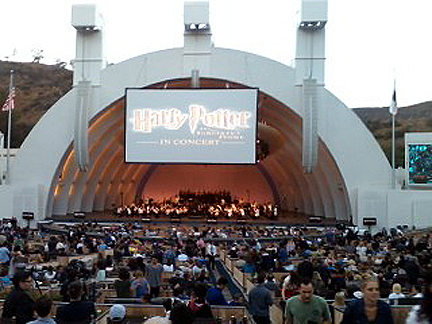 On the heels of last summer’s screening of Harry Potter and the Sorcerer’s Stone, (pictured above) the Phil will present the next two segments in the popular series: Harry Potter and the Chamber of Secrets on July 6 and Harry Potter and the Prisoner of Azkaban on July 7. On both occasions, Justin Freer will lead the orchestra. Another John Williams movie score will be front and center when the Bowl screens Raiders of the Lost Ark on August 4 and 5, with David Newman conducting the Phil. Newman will again lead the orchestra when it accompanies Singin’ in the Rain on Sept. 7 and he will join with John Williams to lead the Phil in the annual “John Williams: Maestro of the Movies” program on Sept. 1, 2 and 3, with accompanying film clips. Williams the composer also shows up on the 10-week classical series, on July 25 when violinist Gil Shaham will be the soloist in Williams’ Violin Concerto. In addition to accompanying Shaham, Stéphan Denève leads the Phil in Sound the Bells, which Williams originally composed in 1993 for a Boston Pops tour of Japan, along with Respighi’s Fountains of Rome and Pines of Rome. 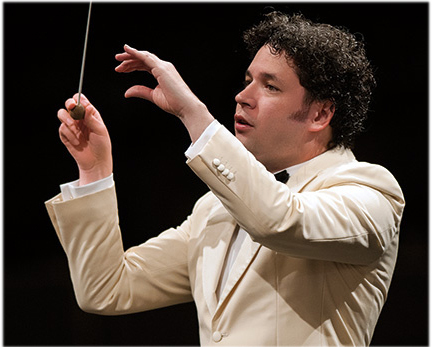 Not only does Dudamel (pictured above) have more appearances scheduled this summer but, for a change, they aren’t all concentrated in the first couple of weeks. He will be on hand for the initial set of classical programs, which begins on July 11 with a program of ballet music featuring dancers Missy Copeland, Marcello Gomes, Sergei Polunin and Natasha Osipova. The July 13 and 18 programs will be duplicates: Copland’s Fanfare for the Common Man and Beethoven’s Symphony No. 9, with the Los Angeles Master Chorale and soloists Amanda Majeski, J’Nai Bridges, Issachah Savage and Ryan Speedo Green joining Dudamel the Phil. All of the soloists will be making their Bowl debuts. In between those weeks, Dudamel leads the Phil in accompanying Tony Bennett on July 14 and 15 (ask not why) and then combines the Phil and YOLA (Youth Orchestra of Los Angeles) in a performance of “Sondheim on Sondheim” — the music and lyrics of Stephen Sondheim — on July 23. Dudamel returns to the Bowl on Aug. 22 with a program that includes the world premiere of Daníel Bjarnason’s Violin Concerto (with Pekka Kuusisto making his Bowl debut as soloist) and Holst’s The Planets. Dudamel also leads the Aug. 24 concert, which pairs John Adams’ Harmonium and Mozart’s Requiem. The Pacific Chorale provides the choral forces. Among the other notable guest conductors are Bramwell Tovey, Mirga Gražinytė-Tyla (pictured left), Vasily Petrenko, Karina Canellakis and Nicholas McGegan. Among the soloists are violinist Joshua Bell, trumpeter Alison Balsom, pianists Pierre-Laurent Aimard and Jean-Yves Thibaudet; and cellist Yo-Yo Ma, who will play all six Bach unaccompanied cello sonatas on Sept. 12. Subscription tickets, in a variety of combinations are now on sale. Single tickets go on sale May 7. With management and the musicians of his Ft. Worth Symphony locked an increasingly acrimonious labor dispute, Miguel Harth-Bedoya’s return last night to the Los Angeles Philharmonic and Hollywood Bowl must have been especially sweet. The 48-year-old Peruvian-born conductor — who has led the Ft. Worth ensemble since 2000 and is also Chief Conductor of the Norwegian Radio Orchestra in Oslo — was the L.A. Phil’s assistant conductor and then associate conductor from 1998-2004. He returns periodically to lead our local band both at the Bowl and at Walt Disney Concert Hall. He seemed particularly serene during moments of Richard Strauss’ tone poem, Ein Heldenleben, which comprised the second half of the evening, and no wonder. Nearly all of the principal players were on hand for the performance and the ensemble — swelled by extra brass, horns and an additional harp — was the largest this summer. Even the cicadas seemed larger in number and volume. In addition to the high quality performance of the ensemble, the solo work by Principal Concertmaster Martin Chalifour and Principal Horn Andrew Bain was breathtaking. Of course, you couldn’t tell that by the obnoxiously restless audience. I’m always amazed when the Phil elects to program a long symphonic work at the Bowl how many people decide to leave part way through the piece, not to mention those who flee before the work even starts. You’d think their coaches were turning into pumpkins at 9:45 instead of midnight. Didn’t they know ahead of time that the work was 50 minutes long? The capper for me was the woman with noisy clogs who clip-clopped down the concrete steps, intently gazing at her cell phone (as least she wasn’t talking on it and didn’t fall down the steps). Moments later she returned to her seat, seemingly oblivious to the orchestra’s playing. Oh, and I forgot to mention the foursome in the very front boxes who decided midway through the performance that it was okay to make their exit. Sheesh! There’s no denying that Ein Heldenleben is long. Most scholars consider the work to be autobiographical (the title translates as A Hero’s Life) and Strauss was a composer with plenty of ego, so one guess as to the Hero was. It’s also my favorite Strauss tone poem, so I confess to bias when I listen to it. Some conductors like to wallow in the music’s excesses but Harth-Bedoya, thankfully, eschewed such a decision. Instead, he was content to let the music (and the magnificent orchestra) speak without excessive tempo extremes to over-emphasize Strauss’ intentions. As I noted earlier, the performance by Chalifour of the themes representing Strauss’ wife was exemplary. This was his 49th Bowl solo appearance in his 20 years with the Phil and it was one of his best. In the first half of the evening, Chalifour brought his irresistibly sweet tone and superb musicality to seven short works by violinist Fritz Kreisler. The tone was especially noteworthy in Caprice vennois and when Chalifour was dancing on the E string during Tambourin chinois. Preceding the music by the Vienna-born Kreisler were two works by that most Viennese of composers, Johann Strauss II: the Emperor Waltz and Thunder and Lightning Polka, both dispatched with panache by conductor and orchestra.